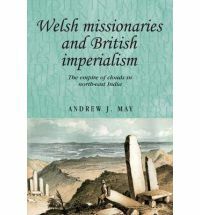 I have recently been reading Andrew May’s Welsh missionaries and British imperialism for a review in the Journal of Colonialism and Colonial Studies and can say that it is both excellent, and beautifully written. Focusing on the experience of both mission and empire in the Khasi Hills of north-east India, May engages in a close analysis of a particular region in order to address the broader themes of Britishness and Welshness; Christianity and empire; distance, authority and identity. His particular emphasis is on the breaking down of homogenous labels through close attention to the dynamics of everyday interaction and encounter. After all, ‘the practised subjectivities of individual British agents in the hills – the ways in which they actually experienced the world and intervened in it – could defy the simple nomenclature of their titles’ (p. 269). In the content of the book too, there is a great deal of interest for those of us concerned with the idea and practice of colonial families: colonial dynasties get attention throughout, and particularly in Chapter Seven (pp. 114-27) which gives them sustained attention. The idea and ideal of the missionary family is often present – both its normative aspect and the performance of familiarity, as well as when family relationships break down or are ruptured (see for example Chapter Ten, pp. 173-95). The dynamics of (family) connections and disconnections, and issues relative to intimacy and distance, meanwhile, are also dealt with throughout – as is perhaps inevitable when looking at mission and empire in this close manner – see for example pp. 258-64. For families on the colonial and spiritual frontiers ‘unsteadiness and disorientation dogged them across the shape-shifting landscape of empire’ (p. 285). For May, ‘this history has been my attempt to grab on to something, to rescue micro-narratives of “what is forgotten as well as what is remembered”, to steady myself and for a moment find meaning and compassion in a confusing landscape’ (p. 285). For me, it is this which is the most important aspect of this book – and something I strive for in my own writing. To recognise and remember that in writing history we are dealing with ‘real people making real choices’ (p. 5); people living their lives and making everyday decisions within the broader frameworks of meta-history. This should not serve to downplay the importance of the broader picture, of for example the realities, inequalities and violence of colonialism. Rather, it is to recognise the importance of the individual within that broader history – whether as conniving and arrogant imperialists (in various guises), or as caring and conscientious individuals; and more often than not with elements of both within them. As a ‘local-level study of the ways in which macro-processes play out for individual people’ (p. 5) this book makes a striking intervention into the history of mission and empire, and is a must-read for anyone with an interest in colonial family history, and the history of both empire and mission more broadly. This entry was posted in Book Reviews, Publications and tagged British Empire, India, intimacy, missionaries, religion, scandal, settler colonialism. Bookmark the permalink.